The Hakko FA-430 is a powerful fume extraction system for clearing contaminated air created by your soldering applications. If your FA-430 is primarily being used to remove odors produced by certain soldering processes, you'll want to check out Hakko's recently announced 999-245 Carbon Odor Filter for the Hakko FA-430 Fume Extraction System. The new 999-245 is an optional pleated media filter that contains highly activated carbon. 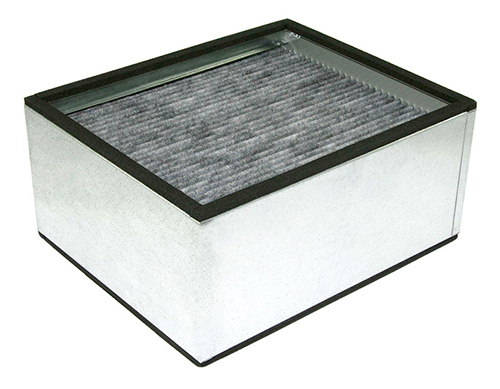 This Carbon Odor Filter has a filtering efficiency of >98% of particulate to 0.3μm and offers greater gas adsorption than the main filter that comes standard with the Hakko FA-430. Because this filter also traps particulates, Hakko requires use of the A1585 Pre-Filter to ensure the 999-245's maximum filter life. For more information about, or to place an order for Hakko's new Carbon Odor Filter, please give us a call at 800-966-6020, or contact us via email. For other Hakko products (including the FA-430 Fume Extraction System and A1585 Pre-Filter), please visit our Hakko Department. Atrix International's line of industrial and commercial vacuum cleaners provide the power and flexibility you need for a wide variety of cleaning tasks. Our extended three-month Social Networking Sale offers an extra 5% off these high-quality vacuums for 90 days (discount expires July 31, 2013). QSource.com's selection of Atrix Vacuum Cleaners includes standard models, vacuums for HEPA and cleanroom environments, and more. Our Atrix vacuum choices range from the "pickup-almost-anything" VACMM - Mighty Mouth Upright Vacuum to the mobile Back Pack HEPA Vacuum/Blower (VACBP1), which is also available in a 220-volt version (VACBP2). To access the discount code for our Atrix 5% off offer, please visit our Facebook Coupons page and click on the "Like" button (if you haven't already – the code will automatically be available to visitors who have previously Liked us). Doing this will also register you for all future Social Networking Sale offers on a wide selection of products at QSource.com. Please note: Our May - July Social Networking Sale offer is valid only on Atrix Vacuum Cleaners and not on filters or accessories and cannot be combined with other offers. Hakko's FX-888D Digital Soldering Station is an inexpensive, versatile tool for a variety of soldering tasks and skill levels. 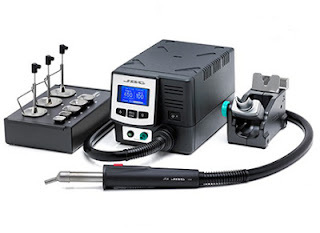 Boasting the quality and reliability of a Hakko soldering station, the FX-888D is the digital replacement for the popular FX-888 analog model. 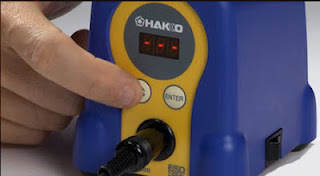 We've previously told you about the Hakko FX-888D in a preview blog, Flickr photos, and an "On the Bench" video. This time, we wanted to pass on a few tips to help you get the most out of the FX-888D's digital settings. 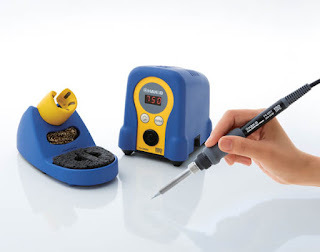 Whether you're an existing owner, or considering purchasing your own Hakko FX-888D Digital Soldering Station, learning how to access and set certain settings will help you get the most out of this feature-rich tool. We're going to focus on three such settings: Setting preset temperatures, changing preset temperatures, and setting up and using the password lockout feature. Turn the FX-888D on while holding the UP button (this will access the Parameters of the unit). The display will show Parameter 1. Press the UP button until you get to Parameter 11 (which controls the presets). Press the ENTER button and you'll see a 0 (zero means off and one means on). Press the UP button to 1, which turns on the presets option. Press ENTER and you'll see 5P (this indicates you have five presets available to use). Pressing the UP button here allows you to choose how many presets you want to use (or you can just press ENTER to stick with the default five presets). Pressing ENTER brings you back to Parameter 11. To save the setting, press the ENTER button until you see a Y (for yes). Pressing ENTER here saves the selections you just made. Now you can simply press the UP button to cycle through your preset temperatures (pressing ENTER to lock in your choice). Turn the FX-888D on and you'll see it comes on at 750° and winds up to that temperature. Press the UP button and the default preset 3 appears and reads 750°. Hit the ENTER button to select this preset. Now, we'll change the 750° to 720°. Hold the ENTER button down until the 7 starts flashing. Hit ENTER to keep the 7 as is. The 5 will start flashing and now we press the UP button until the digits go round to 2 and then hit ENTER. Leave the 0 as is and hit ENTER again. Now preset 3 is set to 720°. Repeat the process for each of the presets you want to customize. Turn the FX-888D on while holding the UP button to access Parameter Mode. Use the UP button to get to Parameter 14 and press ENTER. The unit will display 0, which is off. Press UP to get to number 2 (Complete Lock). Press ENTER to choose it. The display will show three dashes. These are for the password. Use the UP button to scroll through letters and numbers. Hit the ENTER button at your selected character to choose that for the password. Do this for all three dashes. After the last dash is selected you'll return to Parameter Mode. To store your password you need to hold down the ENTER button. When you see the Y, hit ENTER and your password will be saved. From this point on, when the user attempts to change the temperature or any other setting they’ll be presented with three dashes for the password. The unit will display 0, which is off. Press UP to get to number 1 (partial lock). Press ENTER to choose it. After selecting Partial Lockout, the display will show you option 1 and a flashing 1 (temperature adjustment). If you want this to be password locked press ENTER or press UP to go to 0 for no and press ENTER. Next you'll see option 2 (password protect the changing of presets) and a flashing 0. Zero means off and 1 means on. Use the UP button to make your selection and then press ENTER. The third option is for the digital calibration feature. One means yes and 0 means no. Again make your selection with the UP and ENTER buttons. Finally, the display will show three dashes for the password. Use the UP button to scroll through letters and numbers. Hit the ENTER button at your selected character to choose that for the password. Do this for all three dashes. And, again, from this point on, when the user attempts to change any of the options you password protected they'll be presented with three dashes for the password. Pretty easy, right? Now you know how to turn on the Preset Temperatures option, change the Preset Temperatures, and set up the Password Lockout feature. We'll cover additional tips and settings in future blogs. For more information about, or to place an order for the Hakko FX-888D Digital Soldering Station, please visit QSource.com, give us a call at 800-966-6020, or contact us via email. For other Hakko products, please visit our Hakko Department. JBC Tools announced recently that they've upgraded their Hot Air Stations with new profile software to allow the user to create up to 25 work processes and personalize up to nine steps for each program (three parameters for each step - Temperature (ºC/ºF),Air Flow (%) and Time (s)). Existing users can update to the new software via the built-in USB connection or through a UC1000 cable if USB is unavailable. The JBC Tools JT-1QB JT Premium Series ESD-Safe Digital High-Power Hot Air Station, JT-1B JT Premium Series ESD-Safe Digital High-Power Hot Air Station, TE-1QB TE Premium Series ESD-Safe Precision Digital Hot Air Station, and the TE-1B TE Premium Series ESD-Safe Precision Digital Hot Air Station use jointly extractors and protectors for quick, safe desoldering that protects surrounding components by concentrating heat only on the component to be desoldered. These units can access information about the free software update by clicking here. These four new "B" models are a response to customer feedback and they offer improved features including the USB connection for generating graphs, upgrading software, and monitoring parameters from a PC; and an adjustable stand that allows the user to turn a screw and find their best possible working position. The JT-1B and TE-1B models include an extractor desk that has been adapted to work with most current applications. The TE-1B and TE-1QB units also add a new TE-TB precision heater, which is lighter and more ergonomic. For more information about, or to place an order for a JBC Hot Air Station, please visit QSource.com, give us a call at 800-966-6020, or contact us via email. For other JBC products, please visit our JBC Tools Department. There's a hidden danger lurking in your office workspace. This unseen menace can create field effect generation, damage electronics, and shockingly enough, cause an explosion. We are, of course, speaking about the horrors of electrostatic discharge (ESD). When an unprotected carpet can generate up to 20,000 volts—costing you time, money, and potential injury—there's no excuse for not doing something to protect your office/work environment. Enter Static Solutions, Inc. and their CC-4900 Ohm-Shield Carpet Floor Guard Treatment. 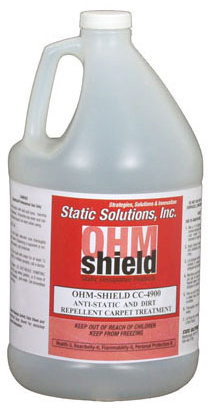 Ohm-Shield Carpet Floor Guard Treatment protects both ESD and non-ESD carpets and fabrics (such as chair cushions or garments) from static generation and dirt attraction. This water-based, environmentally friendly spray treatment is easy to apply: The treatment can be used right out of the container or diluted to 10:1 for dry carpets or 5:1 for damp carpets. The one-gallon container covers approximately 250-350 square feet, while the 5:1 concentration covers 1,250-1,750 square feet. If your work environment deals with sensitive electronics and/or high-traffic areas you need to address the risks of ESD damage. Static Solutions' CC-4900 Ohm-Shield Carpet Floor Guard Treatment is a safe, reliable, low-cost solution that provides protection and brings peace of mind. For more information about, or to place an order for the Ohm-Shield Carpet Floor Guard product, please visit QSource.com, give us a call at 800-966-6020, or contact us via email. 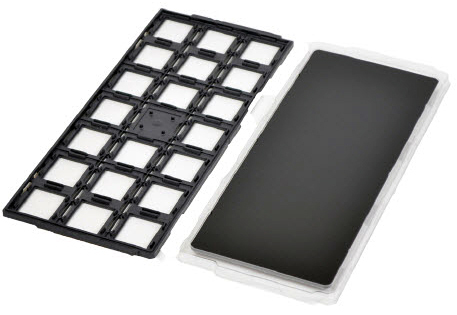 For related products and additional ESD items, please visit our Static Solutions Department. The Boeing 787 Dreamliner, a new device designed to treat newborn jaundice, and a cool new advanced LED light from 3M were among this year's gold award winners of the Edison Awards. The award ceremony was held April 25, 2013, at the Navy Pier Grand Ballroom in Chicago. The Boeing 787 Dreamliner, designed by The Boeing Company Design Team and TEAGUE design consultants, won a gold award in the Transportation category. This innovative commercial airplane was recognized for its impressive energy (it expends 20% less fuel and produces 20% fewer emissions than similarly sized airplanes) and upkeep requirements (it has 40% lower maintenance costs and 10% better operating costs). Firefly Newborn Phototherapy, designed by Design that Matters, won a gold award in the Social Impact category. Firefly was created as the first device for treating newborns with jaundice in the mother's room in rural clinic settings. It's compact, low-resource design provides affordable phototherapy, supports breastfeeding, and reduces staff workload. 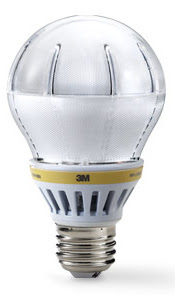 3M's LED Advanced Light, designed by 3M, won a gold award in the Lighting category. This technology allows for an LED replacement bulb to deliver the form and function of an incandescent by using light guide technology to provide a beautiful uniform light source for the home. 3M also won a silver award in the Diagnostic/Analytic Systems category for its Molecular Detection System designed by 3M Food Safety. Please follow the link for a complete list of 2013 Edison Awards Winners. For a look at past winners from 2012, 2011, and 2010, please visit the Edison Awards Web site. Our monthly Social Networking Sale has always had the goal of providing you with great opportunities to save on top-quality product solutions. We're very excited to tell you that our new offer is an extra 5% off Atrix International Vacuum Cleaners at QSource.com AND you'll have THREE months to save. Our Atrix offer is valid from May 1, 2013 to July 31, 2013. Atrix International, Inc. is a leading manufacturer of vacuum cleaners for industrial and commercial use. Their line of high-quality vacuums includes Standard Vacuum Cleaners, Cleanroom ESD-Safe Vacuum Cleaners, ESD-Safe Vacuum Cleaners, and HEPA Vacuum Cleaners. With our offer discount you can save on top-notch vacuums like the Atrix International Omega Green Supreme IPM Vacuum with HEPA Filter, which is a quiet and powerful unit for capturing everything from insects to hazardous particles. Or perhaps the Atrix International Cleanroom ESD-Safe HEPA Vacuum when you need a vacuum for use around sensitive electronic equipment. Getting your discount code follows the usual process: All you need to do is "Like" us on our Facebook Coupons page (if you’ve previously done this you'll be able to access the code just by visiting that page). This will also register you for all future Social Networking Sale offers on a wide selection of products at QSource.com. Please note: Our May Social Networking Sale offer is valid only on Atrix vacuum cleaners and not on filters or accessories and cannot be combined with other offers.